Can Nepal Attract a Foreign Investment Windfall? Nepal’s Investment Summit 2019 was promising, but serious challenges remain. Nepal has concluded a mega event – Investment Summit 2019 – by securing investment commitments worth around $17.5 billion from both domestic and foreign investors. However, it’s an open question if such commitments will be translated into reality. Investment Summit 2019, the third edition of such a jamboree in the country, was successful in widely broadcasting the current government’s political rhetoric of “Prosperous Nepal, Happy Nepalis.” But the Investment Board of Nepal (IBN) is being blamed for not coordinating with the state machinery in order to push for reforms that will yield results in both the short and long term. With Nepal’s new federalism in play, the government has been struggling to manage personnel under the new administration system. 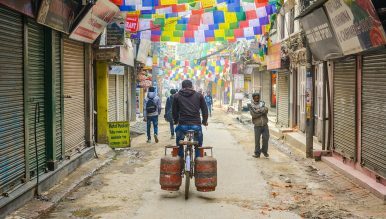 Nepal is supposedly marching toward becoming a middle-income country by 2030. For Nepal to become a middle-income country, it has to be able to achieve double-digit growth rates in consecutive years, secure higher investment in productive sectors, and invest around 12 percent of GDP annually in infrastructure development alone. Underscoring the importance of foreign direct investment (FDI), the government has been trying to attract foreign investors but the whole effort is tenuous due to a lack of institutional coordination, the politicization of technical issues, and incompetent leadership in core agencies that are supposed to have the entire state machinery in confidence. Nepal’s effort to present itself as a manufacturing hub between two giant markets, India and China, intrigues foreign investors. Nepal’s own market is too small to be very attractive, especially if we consider only the size of population that actually has access to finance and sufficient purchasing power capacity. Most of the people in Nepal still need basic services such as safe drinking water, basic health and education services, and a minimum level of power to cook and keep the lights on at night. All these necessities are supposed to be provided by the state in a country where the constitution clearly leans toward socialism. The question now is whether foreign investors will actually channel money to complement the state’s task of delivering basic services to the people. There are cases in the world where private investors, both domestic and foreign, have joined hands with the government to develop public infrastructure to improve service delivery. But that has happened with strong and sound public-private partnership (PPP) operations in place. Nepal has just introduced Public-Private Partnership and Investment Act, which aims to establish a PPP Center within the Investment Board of Nepal. However, the desired PPP operations to facilitate private investment can happen only if government pushes for reforms to empower and improve the human resources of the state bureaucracy and make them investment friendly. Trying to sideline the bureaucracy by blaming it for being inefficient will eventually have a cost for the country. Part of the reason for slow pace of development and change thus far, under the current government with its two-third majority, is the rivalry between bureaucrats and politicians. Coordination is nowhere to be found even now, a problem that surfaced even during the Investment Summit as Minister for Industry, Commerce, and Supplies Matrika Yadav discounted the whole effort. Yadav claimed that he was never consulted regarding the modus operandi of the event even though the Department of Industry and Office of the Company Registrar are under his ministry. Although Nepal has been blessed with political stability for the first time in decades, thanks to 2017 election results that will see one party rule for a five-year term, the tendency of making decisions based on immediate gains and short-term vision is still there. Unfortunate political games that are pushing the country toward recentralization. Despite this, many foreign investors came as tourists this time to participate in the summit. It all depends on Nepal’s leadership whether these investors will come with actual investment in the future. The backbone of Nepal’s development is money. Where that money will come from is a key question at the moment. To bring FDI in, the government needs to take care of issues such as governance, coordination, and communication where federalism has created a huge area for concurrency among local, provincial, and federal governments. Nepal’s goal to become a middle-income country by 2030 relies not on whether the Chinese and Indian markets would be open for it but on whether the government establishes an environment of trust among the various agencies and layers of governments as well as empowering and engaging the bureaucracy in the required reform process. Bhoj Raj Poudel is a Kathmandu-based writer who focuses on policy issues. Is Nepal Ready to Become a Developing Country? As Nepal prepares to leave the least developed country (LDC) category, it needs to manage the impact on its export sector. Nepal Has a New Prime Minister. Now Comes the Hard Part.Nepal's Federalism Is in JeopardyNepal's Unending Political InstabilityNepal’s Military Tries Its Hand at InvestingNepal's Constitution: Out of the Frying Pan, Into the Fire?